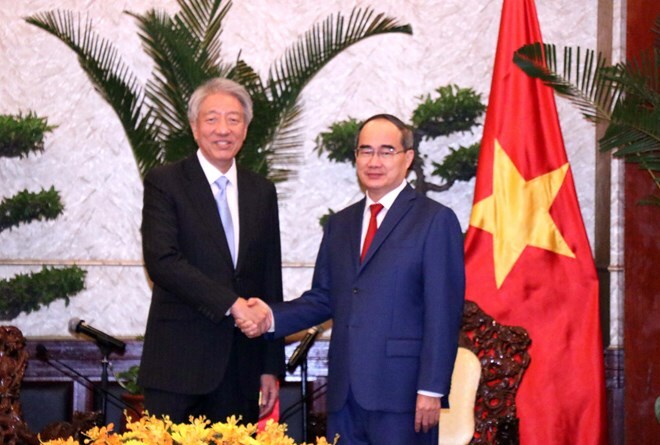 HCM City (VNA) – Secretary of the Ho Chi Minh City Party Committee Nguyen Thien Nhan had a meeting on March 25 with Singaporean Deputy Prime Minister and Co-ordinating Minister for National Security Teo Chee Hean who is on an official visit to Vietnam. Nhan welcomed the Singaporean Deputy PM’s visit, holding that it will help bolster the strategic partnership between the two countries in the future, benefiting both sides. He affirmed that Vietnam pays great attention to developing ties with Singapore in all fields and all channels, expressing his delight at the strong growth in bilateral partnership over the years, which has been reflected in high political trust; close friendship; and all-round cooperation, especially in economy, education, and regional security cooperation. HCM City hopes to learn from Singapore in applying advanced technology in urban management, education, innovative startup, and smart city construction, he said. Alongside, the city wishes for Singaporean experts’ cooperation and experience in green city development, urban lighting systems, as well as tourism, he said. For his part, the Singaporean Deputy PM said that Singapore hopes to promote its strategic partnership with Vietnam in both bilateral and multilateral aspects, as well as within the ASEAN framework. Singapore considers Vietnam a model country for international economic opening, integration, and transformation to get closer to the global economy, he said. Teo stated that Singapore is keen on developing ties with Vietnam and HCM City in particular so as to learn from and support each other during the development process. He thanked the HCM City leader for supporting Singaporean businesses during their investments and operations in the city over the years, expressing his hope that the city will continue to create favourable conditions for investors to make long-term operations in the city. Singapore highly values the plans that the city has applied in the early stages of smart city building, including the application of technology in management and improvement of local supervision over the governmental operation. By the end of 2018, Singapore was the biggest investor in HCM City with about 1,100 projects worth over 10.7 billion USD.